This week on The Bugcast: in our third celebratory special, Dave hosts his selection of favourite tracks from the past year, featuring 16 brilliant tracks of Creative Commons and independent music from Aphemia, Pixelplants, Semme Automatic, RogerThat, Scream Inc., Forget The Whale, The Grus, Axel Antunes, Declaration, Nick Celino, The Glass Child, DreamsAboutVictory, and The DŁX. 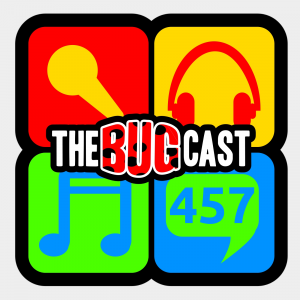 This week on The Bugcast: another UK terror incident and political nose-poking, and 8 amazing tracks of Creative Commons music from Radio Insecto, Ralph Castelli, Pablo Samonta, Tracing Arcs, Mazelo Nostra, Semme Automatic, Wolf, and texasradiofish. This week on The Bugcast: burger-based joyriding, train-based toilet humour, plus 8 amazing tracks of Creative Commons music from The Riders, Plastic Light Factory, Semme Automatic, The Grus, Dofhei Project, Thrive, Ridgway, and Rusty Tea Makers.